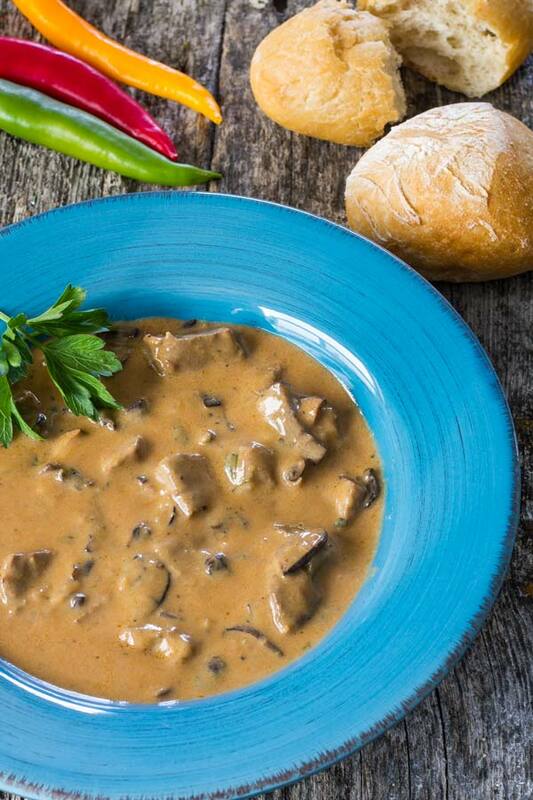 One of the easiest stew recipes out there, Stroganoff has its origins in mid 19th century Russia but it was a much simpler dish then it is today. People make Stroganoff from anything you can think of, starting with beef and going through every sort of other meat down to pork, or up to pork, your choice. The North American variations though, are not far from the original recipe which is made from BEEF only, but they all include some sort of side dish like pasta, rice or mash potatoes, which I don’t really care too much about. My personal take does not include any of those but you can definitely serve this dish with whatever you like. Other than that, it is very easy to make, probably within 30 minutes and I guarantee, you will scoop out every last bit of sauce from your plate, even my dog was very excited about it but then again, she is not picky. Melt butter in a large skillet on medium heat and add the beef cubes. When all the sides are properly browned, remove to a bowl and set aside. In the same pan add onions and caramelize for 2-3 minutes; set aside. In the same pan add mushrooms, sherry cooking wine and Worcestershire sauce and sautee for 6-10 minutes or until the liquid is almost evaporated. Pour the flour and stir for one minute. Serve over your choice of side dish.